Would you consider the devices that snap onto the breaker and are held in place by the panel cover a "permanent" means? You raise a good question, and the pen should be put to the paper for a 2005 proposal. None of the items you describe here are really "permanent" -- so that will be the question -- can they still be used? I really hat it when manufacturers try to use/abuse the code to hawk their latest wares. If Bussman thinks that everybody is going to replace all their fuse boxes, motor disconnects, etc., they must have caught that Mississippi Mosquito virus! NEC doesn't cover or address temporary or maintenance lockouts- that's a matter for OSHA. OSHA say USE THEM. We've come a long way in ten years; it wasn't so long ago that there were no lock-out devices for fuses and circuit breakers. I admit to violating OSHA rules on a regular basis. For example, I have purchased my own, rather than relying on my employer to provide an adequate assortment. In doing so, I am violating OSHA rules, which forbid this. So cite me! I also use my toolbox lock for lock-out purposes- another violation! I will do whatever is necessary to protect myself, even if the rules say "no." I have also used zip-ties to secure lock-out devices. Something about a brass padlock swinging around in a hot box, or somebody banging into a swinging door (that the lock keeps from closing) strikes me as silly. The one on the bottom left of the "Unpermissable" ones is a good one. Locks out everything from a snap switch to a big breaker. I guess I've got to throw it away? When a new installation is made for a motor circuit, the NEC in 430.102 requires that a permanent lockout device be provided as part of the equipment. 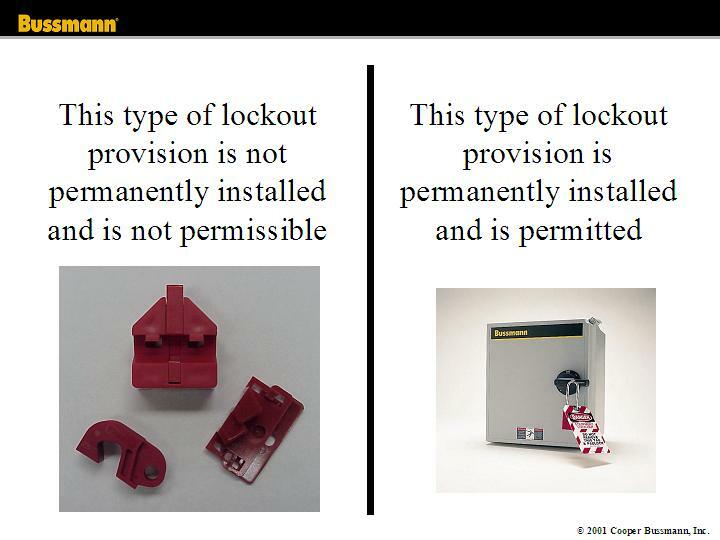 It is a code violation to install a motor circuit disconnect that can only be locked out by the use of a temporary device. Temporary lockouts will still be required for existing disconnects and non-motor disconnects. Lock out/ tag out is a very important safety issue and we need to follow the rules. Most people don't realize how much this code will enforce. Doesn't this code mean that any well drilled in the front (back) lawn also needs a disconnect outside and within 50' and insight of the well head? How about ejector pumps? attic fans? any motor? etc? This can be far reaching if you think about it.